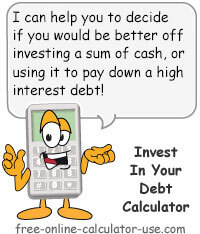 Invest in Your Debt Calculator for Answering the Age Old Question: Pay Off Debt, or Invest? This calculator will calculate the returns on a traditional investment and then compare them with the guaranteed, tax-free returns you could earn if you used those funds to pay down high interest debt instead. The introduction includes the hidden reason we end up with high interest debt in the first place. Determine your highest interest outstanding debt and enter its current terms in this section. Enter the balance owed on your highest interest rate debt. Enter as a dollar amount but without the dollar sign and any commas. Enter the interest rate of your highest interest rate debt. Enter as a percentage, but without the percent sign (for .18 or 18%, enter 18). Enter the monthly payment amount for your highest interest rate debt. Enter as a dollar amount but without the dollar sign and any commas. Enter the factors related your tax bracket and your preferred traditional investment. The calculator needs these factors to determine which is better, using cash assets to pay off debt or to invest them (or keep them invested) in a traditional investment. Enter your tax bracket (10, 15, 25, 28, 33, or 35) expressed as a percentage, but without the percent sign (for .15 or 15%, enter 15). If you're unsure as to what to enter, visit the IRS website to view the latest tax guide. Enter the monthly amount you have available for investing or paying down debt. If you are only interested in a lump sum investment, leave this field blank and enter the lump sum amount in field below this one. Enter as a dollar amount but without the dollar sign and any commas. If you have a lump sum of money available for investing or paying down debt, enter it here. If no lump sum is available, enter zero or leave blank. Enter as a dollar amount but without the dollar sign and any commas. Enter the before-tax interest rate you expect to earn on a traditional investment where earnings are taxable. Enter as a percentage, but without the percent sign (for .15 or 15%, enter 15). Enter the amount of any upfront fees or commissions you will pay for a traditional investment. Enter as a dollar amount but without the dollar sign and any commas. Enter the amount of any annual account management fees you will end up paying with a traditional investment. Enter as a dollar amount but without the dollar sign and any commas. Based on your entries, this is how much you would earn from your debt investment. Based on your entries, this would be your net earnings from a traditional investment. This free online calculator will calculate the return on investment of using discretionary income to pay down high interest debt, and then compare those earnings to those you would earn from a traditional investment. The goal of this calculator is to show you why paying off debt is the safest and best way to invest money. But before you start plugging in the numbers, let's first make sure you are fully aware of all of the factors that need to be considered. Enter the balance owed to your highest interest rate debt. Enter the annual interest rate of your highest rate debt. Enter the monthly payment amount you are paying toward your highest interest rate debt. Enter your tax bracket percentage. If you wish to compare returns on a monthly investment of funds, enter the monthly amount. If you wish to compare returns on a lump sum investment, enter the lump sum amount. Enter the percentage return on investment you expect to earn from a traditional investment. Enter any upfront costs you would be required to pay to open a traditional investment (trade, etc.). Enter any annual fees that will be charged by the firm handling your traditional investments. Tap the "Calculate Debt Investment" button and scroll down to view the results. Contrary to what most "financial experts" will tell you, when it comes to deciding whether to invest or pay off debt, it's not simply a matter of calculating the "financial" return on investment. Because in order to make the best decision, you must also take the emotional return on investment into consideration. If you choose to invest your money you will open yourself up to all the fear, worry, and anxiety that comes from the very real possibility that some world event (9/11, financial market meltdown, etc.) might cause the value of your investments to plummet. On the other hand, if you choose to pay down your debts you will actually experience the opposite -- less fear, less worry, less anxiety and more peace of mind. Nobody gets a commission or recurring account management fees for selling you on paying off your debts. When you purchase a traditional investment, someone gets paid a commission for selling it to you. Worse yet, if you go with a full service broker, you get to pay recurring account management fees -- regardless of whether your investment makes or loses money. Now there's a major conflict of interest for you. On the other side of the coin, when you pay down your bills you don't have to pay any commissions or account management fees, and the returns on your investment are guaranteed!